The Ehime Maru and USS Greeneville collision was a ship collision between the United States Navy (USN) submarine USS Greeneville (SSN-772) and the Japanese fishery high school training ship Ehime Maru on 9 February 2001, about 9 nautical miles (17 km) off the south coast of Oahu, Hawaii, United States. In a demonstration for some civilian visitors, Greeneville performed an emergency surfacing maneuver. As the submarine surfaced, it struck Ehime Maru, a fishery high school training ship from Ehime Prefecture, Japan. Within minutes of the collision, Ehime Maru sank. Nine of its crewmembers were killed, including four high school students. About 1200 local time on February 9, 2001, the Japanese fishing and training vessel Ehime Maru (figure 1), with 20 crewmembers, 13 students, and 2 teachers on board, departed pier 9 in Honolulu, Hawaii, en route to fishing grounds about 300 nautical miles south of Oahu. The area weather predictions for the day included a coastal waters forecast advising caution for the waters south of the islands from Kauai to Maui because isolated thunderstorms to the east were generating strong, gusty 15- to 20-knot winds, which, in turn, were producing waves of 8 to 12 feet. The Ehime Maru was in the middle of a 74-day training voyage that had originated in Japan on January 10. 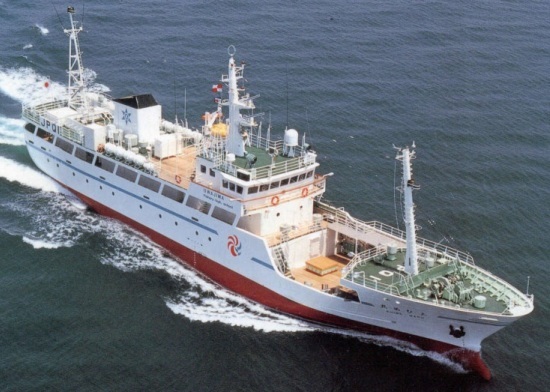 The Japanese fishing vessel Ehime Maru, built in 1996, provided fisheries and engineering training to high school vocational students. The Ehime Marus master who had been a mariner for 40 years stated in his reports that when the Ehime Maru left Honolulu on February 9, the vessel and its equipment were operating properly. He further stated that, in preparation for the voyage, one of the vessels two radar sets was turned on about 30 minutes before getting under way. The Greeneville had departed Pearl Harbor earlier that morning,, carrying 106 crewmembers (11 officers and 95 enlisted persons), 16 civilian visitors, and the COMSUBPAC chief of staff. The civilian visitors were to receive a brief presentation, including a slide show, familiarizing them with the submarines operations. The civilians were also allowed to ride on the main deck and to visit the bridge inside the sail while the submarine transited the harbor, operating on the surface. Other scheduled activities for the visitors included dining with the ships officers and observing maneuvers, or evolutions, which the commanding officer (CO) characterized as designed to demonstrate the submarines capabilities (it should be noted that the accident occurred during this phase of the visitors’ schedule). Photograph showing crewmembers at the top of the Greenevilles sail and around a hatch on the main deck. The Greeneville was an arctic-capable submarine, meaning its sail and rudder had been strengthened to enable it to break through ice. Pre-0500 – Fire control officer of the watch checks fire control equipment in control room and finds that everything operates correctly. Pre-0700 – Navigator reports to commanding officer that the control rooms Analog-Video Signal Display Unit (AVSDU), which provides a backup display of sonar data, is inoperative. 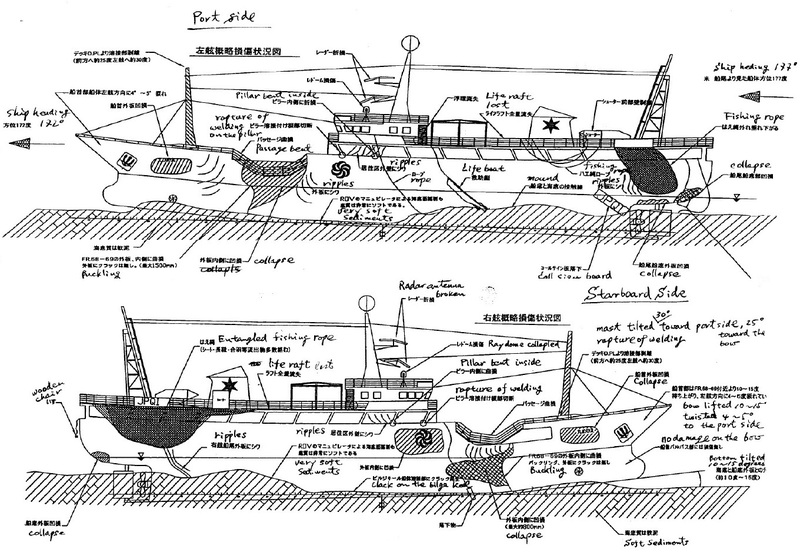 As a result the officer of the deck in order to compensate for the loss of the AVSDU, needed to periodically go into sonar to assay the contact picture. The malfunction of the sonar repeater did not meet the criteria for a significant equipment casualty that would have precluded the submarine from sailing. 0730 – Commanding officer greets 16 distinguished visitors at dockside as they board the Greeneville at Pearl Harbor. The distinguished visitors are assembled in the crews mess, where they are given a brief presentation, including a slide show, about the submarine. They are broken into two groups for tours of the vessel. 0757 – Greeneville departs berth. 0933 – Navigator assumes watch as officer of the deck. 1045 – Commanding officer joins first group of distinguished visitors for lunch at first seating, which is from 1045 to 1145. 1103-1131 – Dive to classified depth. 1130 – Underway watch change scheduled. Fire control officer of the watch assumes watch at fire control console. Sonar supervisor assumes watch in sonar room. 1143 – Main propulsion assistant assumes watch as officer of the deck (second officer of the deck) in the control room. 1145 – Executive officer joins second group of distinguished visitors for lunch at second seating, which is from 1145 to 1245. 1200 – Sonar supervisor, in preparation for planned maneuvers, checks sonar stack for loose gear. Ehime Maru departs Honolulu. 1207 – Officer of the deck orders course change to north. 1228:59 – Sonar begins tracking contact S-12 (a suface vessel). 1231:59 – Sonar begins tracking contact S-13 (the Ehime Maru), bearing 358°. 1232:59 – Fire control system automatically generates first solution for S-13 (the Ehime Maru). 1240 – Officer of the deck orders baffle clear. 1242:15 – Greeneville changes course to 240°, and sonar drops tracks on both S-12 (a surface vessel) and S-13 (the Ehime Maru) when they enter the baffle area. 1245 – Greeneville resumes northerly course. 1257 – Ehime Maru completes stowing anchor and increases speed to 11 knots. 1306 – Executive officer advises commanding officer that ship needs to start maneuver demonstrations if submarine is to meet the distinguished visitors scheduled return time to Pearl Harbor. 1310 – Visitors enter control room; commanding officer goes into sonar room to assay contact picture. Observes two contacts, S-12 (a surface vessel) and S-13 (the Ehime Maru), to the north and northwest. When the Greeneville crew began high-speed maneuvers to demonstrate the capability of the submarine to the visitors, 33 people, including crew and civilians, were in the control room and the sonar room. This illustration below shows the approximate location of the civilians when the submarine executed the last evolution, an emergency surfacing maneuver. 1314 – Commanding officer enters control room and talks with visitors, advising them of the best locations to observe the submarines maneuvers. 1315 – Greeneville increases speed to 14 knots and begins angle maneuvers ranging in depth from 150 to 650 feet. 1315-1324 – Sonar supervisor and sonar operators, while attempting to track targets, interact with five visitors who enter the sonar room. 1324 – Sonar technician who returns to get his jacket asks visitors to leave the sonar room before Greeneville begins rudder maneuvers, or high-speed turns. 1325 – Commanding officer directs officer of the deck to order the following turns during the high-speed maneuvers: Greeneville to turn right from a course of 000° right to 140°. 1326:27 – Greeneville is steady on 140°. Time steady on course until next turn: 16 sec. 1326:43 – Greeneville to turn left to 340°. 1328:04 – Greeneville is steady on 340°. Time steady on course: 23 sec. 1328:27 – Greeneville to turn right to 120°. 1329:47 – Greeneville is steady on 120°. Time steady on course: 23 sec. 1330:42 – Greeneville completes high-speed maneuvers and comes left to 340°. 1331 – Commanding officer directs officer of the deck to prepare to go to periscope depth and to be there within 5 minutes. 1332 – Commanding officergoes into sonar a second time to determine contact picture; watches as sonar regains S-12 (a surface vessel) at 1332:03 and S-13 (the Ehime Maru) at 1332:48. 1332:54 – Greeneville arrives at 150 feet from a depth of 400 feet. Total time above layer depth is 91 seconds. 1333 – Commanding officer returns to control room; directs officer of the deck to order a baffle clear to course 120°. 1333:03 – Sonar begins tracking S-14 (a surface vessel). 1334:48 – Tracking solution entered for S-14; S-12 fades (two surface vessels). 1335 – Baffle clear complete. Officer of the deck orders sonar to report all contacts; sonar reports S-13 (the Ehime Maru) and S-14 (a surface vessel). 1336 – Commanding officer announces that he has good feel for contact picture. Later stated that he thought the contacts were S-12 (a surface vessel) and S-13 (the Ehime Maru). 1336:45 – Commanding officer orders ship to periscope depth (60 feet). 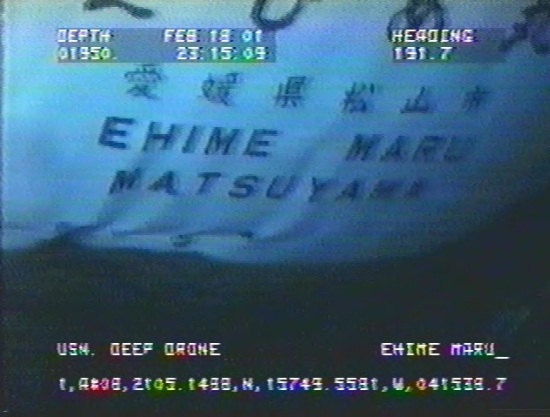 1337:48 – As submarine ascends, fire control solution is updated, indicating S-13 (the Ehime Maru) is within 4,000 yards. 1338 – Submarine periscope breaks surface of water. 1339 – Officer of the deck conducts three rapid 360° periscope sweeps and reports No close contacts. Under-instruction operator in electronic support measures (ESM) room reports No close contacts to the conn.
1339:04 – Commanding officer takes periscope from officer of the deck and orders the ship to 58 feet. 1339:30 – Commanding officer conducts periscope search in the direction where he believes S-12 (a surface vessel) and S-13 (the Ehime Maru) to be. 1340 – Commanding officer orders emergency deep. Total time at periscope depth: 66 sec. 1340 – S-14 fades (a surface vessel). 1340 – As submarine begins to descend, commanding officer asks quartermaster the course to P/H (“Poppa/Hotel, the unmarked seaward entrance to Pearl Harbor). Quartermaster responds 340°, and CO orders turn to 340°. 1340:34 – Submarine starts to come left from 121° to 340°. 1342:25 – Greeneville initiates emergency main ballast tank (EMBT). The guests onboard the submarine seconds after the collision quoted the commanding officer as saying, ”What the hell was that?”. After the submarine slowed and the periscope could be raised, the commanding officer looked into the periscope and announced that the submarine had struck another ship. The collision between the Greeneville and the Ehime Maru occurred about 9 miles south of Oahu, Hawaii, at position 21°05.5′ N, 157°49.1′ W. In the following picture the dotted line indicates the edge of the submarines assigned submerged operating area. The plot below shows the tracks of the Greeneville and the Ehime Maru. The Greeneville track is annotated with key events on the submarine beginning at 1331. The Ehime Maru track is annotated with the position of the fishing vessel at some corresponding times. Personnel on board the Ehime Maru reportedly heard two loud noises and felt the fishing vessel shudder. The bridge crew all stated that they did not see anything before the collision. According to the Ehime Marus master, There was no ship at all nearby. He stated that the range of vision was good and that there was no outline of a ship nearby on the radar. He said that he then felt two impacts and the stern of the ship lifted up. After the impact on the fishing vessels port aft quarter, the Ehime Maru bridge personnel looked aft and saw the submarine as it broached the surface of the water. The Ehime Maru’s lookout said that after observing the submarine, he turned forward and saw diesel fuel squirting from the fuel tank vent on the forward port side of the fishing deck. The Ehime Maru’s master said that he realized immediately that his vessel was in trouble. Within 5 seconds of the collision, the Ehime Maru lost all power, including the backup systems on the emergency generator circuit. He said that he tried to call for assistance using the VHF-FM marine band radios, but they would not work. The master directed the chief radio operator to activate the emergency position indicating radio beacon (EPIRB), a portable 406-MHz model with a hydrostatic release, that was installed immediately outside the pilothouse, on the port bridge wing. According to witnesses, the chief radio officer was wearing an automatically inflating lifejacket and was near the bridge when the vessel began to sink. No one recalled seeing him reentering the pilothouse, leaving the ship, or swimming in the water. Meanwhile, on the third deck (the lowest deck of the fishing vessel), the chief engineer, the first engineer, and the first oiler were in the engine control room when the oiler said he heard a loud scrape and then felt an impact. He said that the space immediately went black, and water and fuel flooded the area with such force that he was violently knocked about. He said that he could not recall how he was able to escape the engine room but thought that water gushing in had carried him through the engine room and up through a deck opening to the second deck. From there, he climbed up the ladder and out of the vessel. He said that he never saw the chief engineer and the first engineer after the impact. At the same time, on the second deck, the nine students who survived the accident had just finished lunch and were either in the crew mess or in cabins that were immediately forward of the mess. The four students in the crew mess went directly aft. The students in their cabins said that when they looked out into the passageway, they saw water and oil gushing up the stairwell from the deck below. The Ehime Maru was equipped in the berthing areas and at the watch stations with automatically inflating lifejackets. Most of the surviving students were able to retrieve the lifejackets from their cabins; other students said that they did not think to do so. They said that as they went aft in the passageway, they had to wade through an ankle-deep mixture of oil and water. Most of the students first went to the fantail area, or stern overhang, of the main deck. From there, they went to the mustering station aft of the pilothouse. 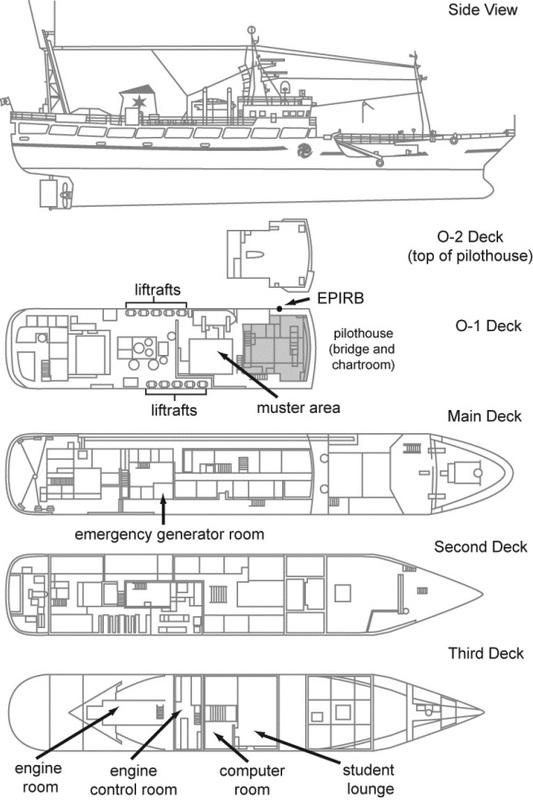 The Side view of the Ehime Maru and plan views of the decks are shown in the following picture. All survivors reported gathering in the muster area behind the pilothouse. Several witnesses stated that after it settled in the water, the Ehime Maru then sank by the stern at a 30° to 45° angle within 5 minutes of the collision. As the ship began to submerge, some people went into the water or were washed off by the waves coming over the stern. The remaining personnel attempted to climb a ladder to get onto the top of the pilothouse. Two students were washed off the ladder into the sea. Other students and crewmembers reached the top of the pilothouse only to be washed off by waves as the vessel sank. The oiler stated that he injured his shoulder when a wave washed him against a searchlight mounted on top of the pilothouse. Survivors carried underwater with the sinking ship either swam up to the surface or their lifejackets automatically inflated and carried them up. Witnesses from the submarine and the Ehime Maru reported that, after the fishing vessel sank, the water was covered with a heavy sheen of oil. The second engineer wound up in a raft by himself. He said that the submarine approached him and its crewmen called out to him. He yelled back, but the English/Japanese language barrier prevented him from understanding them. 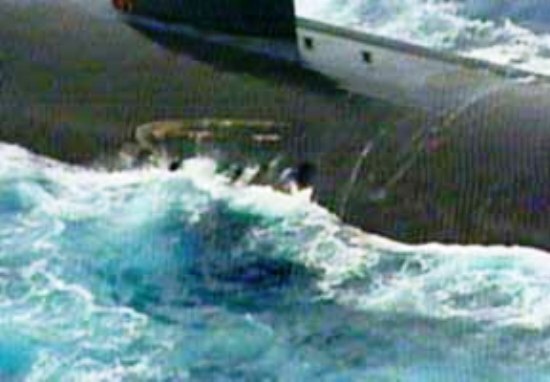 After determining that the Greeneville had struck a surface vessel, the submarine commanding officer reported the collision to the Navys COMSUBPAC operations center at 1348. COMSUBPAC center personnel, in turn, notified Navy command personnel and Coast Guard GroupHonolulu by both landline telephone and VHF-FM marine radio. After the submarine struck the Ehime Maru, the Greenevilles engineering officer took over as officer of the deck during the response effort and initiated rescue and assistance measures as required by operational procedures. 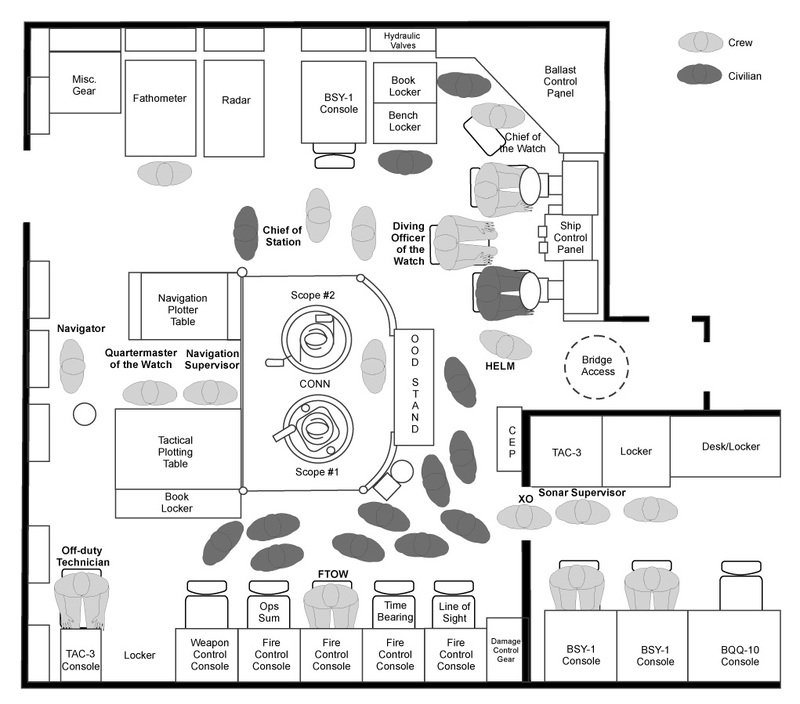 In addition, a medical treatment station, manned by a hospital corps technician, was established in the officers wardroom. Coast Guard or Navy units were on scene continuously for 22 days, searching for missing personnel. Two civilian vessels of Japanese registry also participated in the search. Initial attempts to locate the fishing vessel were unsuccessful because of bad weather and because of an erroneous report of the accident site. The Safety Board assisted the Navy in determining the location of the Ehime Maru by acquiring radar data from the U.S. Air Force 84th Radar Evaluation Squadron and the Federal Aviation Administration (FAA) and filtering the data to plot a track of the Ehime Maru that correlated with the time, heading, and speed reported by the master of the fishing vessel. (See discussion in Safety Board Performance Study section.) The Navy then moved the search area to the end of the radar track. On February 16, Navy sonar detected a vessel and, at 1129, Navy personnel were able to identify the fishing vessel by maneuvering a remotely operated vehicle, the Scorpio II, so that its video cameras displayed the Ehime Marus stern plate. The vessel was sitting almost upright in 2,003 feet of water about 1,000 yards from the reported collision site but almost directly under the end of the radar track. For the next week, two underwater remotely operated vehicles, the Scorpio II and the Deep Drone, searched the Ehime Marus exterior and the sea bottom surrounding it for the nine missing persons, with no success. The search effort was suspended on March 2. The following picture shows the port and starboard side damage of the Ehime Maru. Damage caused to Greeneville by the collision with the Ehime Maru. 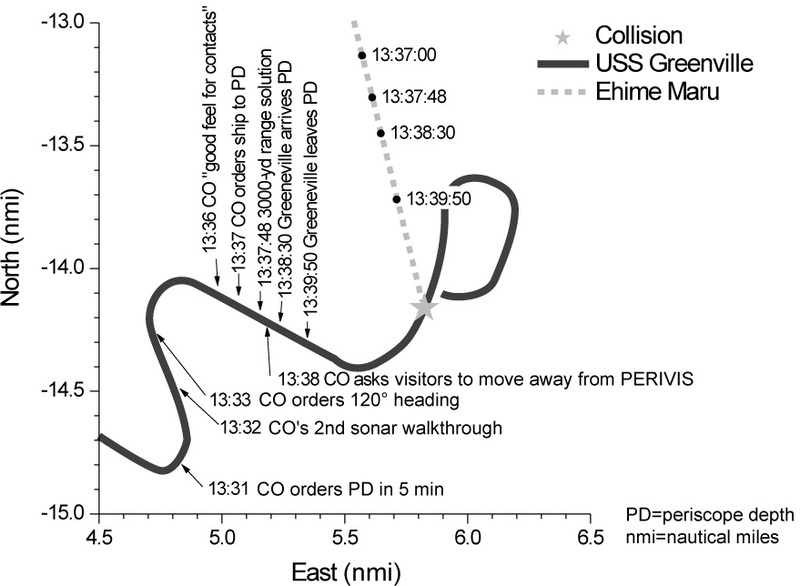 The following graphic representation of the US Submarine Greeneville and the Fishing Vessel Ehime Maru collision was developed by David Swann/Star Bulletin showing how the accident occurred, according to testimonies at the Navy’s court of inquiry, the National Transportation Safety Board, and news reports. On February 9, 2001, the Commander, U.S. Submarine Force, Pacific (COMSUBPAC) ordered an official inquiry into the collision between the Greeneville and the Ehime Maru. In its final report, the court of inquiry issued 26 recommendations, which, among other actions, included disciplinary measures against shore-based officials and six Greeneville crewmembers and reviews of various programs and procedures for adequacy and compliance. Mentioned recommendations are summarized below. Ensure compliance with operating standards that permit only fully qualified sonar technicians to stand sonar watch. In June 2001, COMSUBPAC issued guidance by classified message to subordinate echelons and all Pacific Fleet submarines reemphasizing sonar watchstanding requirements. The message directed that under-instruction sonar watchstanders be supervised by a qualified watchstander assigned on the watchbill to that station, not by the sonar supervisor. Compliance with sonar watchstanding qualifications and sonar watchstanding proficiency is now routinely inspected during the interdeployment training cycle. Review the adequacy of the COMSUBPAC Operational Risk Management (ORM) program. COMSUBPAC conducted an internal audit of COMSUBPAC to ensure compliance with Navy ORM instructions in OPNAVINST (Chief of Naval Operations instruction) 3500.59. In June 2003, Commander of Naval Forces instruction 5040.12 was revised to require that ORM be used in interdeployment training cycle inspections and assessments. Review the ability and means of submarine squadron commanders and their staffs to provide meaningful oversight and objective feedback to their submarine commanding officers and crews during the interdeployment training cycle. On August 28, 2002, a classified COMSUBPAC instruction was revised to include comprehensive interdeployment training cycle management. A squadron commander now conducts a 2-week assessment early in each submarines interdeployment training cycle to identify, among other things, the strengths and weaknesses in basic submarine operations. The assessment results are used to focus training during the interdeployment training cycle to prepare the submarine crew for its next overseas deployment. Coordinate a review of submarine open-ocean search-and-rescue capa-bilities and requirements with the lead type commander and make appropriate recommendations to the Chief of Naval Operations. Naval Warfare Publication 3-50.1 (rev. A) promulgates Navy doctrine for search-and-rescue operations. The publication is subject to periodic review and update. It has been updated by change on three occasions since February 9, 2001. No changes were suggested by the Navys court of inquiry report and none of the intervening changes relate specifically to submarine open ocean search-and-rescue operations. Review the maritime traffic density of the Hawaiian operating area with the Coast Guard and other appropriate government agencies every 3 years. A COMSUBPAC memorandum, dated April 23, 2001, now requires a maritime traffic density review for submarine force training agendas. Provide information and training to the force concerning the Greeneville collision. On April 23, 2001, COMSUBPAC sent a lessons learned message to all COMSUBPAC COs. The message was followed by a classified joint message from the commanders of the U.S. Atlantic and Pacific submarine forces, summarizing the main findings and opinions of the investigation as approved by the Commander of the Pacific Fleet. All submarine wardrooms and senior enlisted quarters have conducted training on the factors that contributed to the collision. A case study of the collision between the Greeneville and the Ehime Maru has become part of the curriculum at each level of tactical training for submarine officers. In addition, each wardroom is required to train on this case study annually. Failed to perform adequate contact analysis. Rushed the procedures for moving to periscope depth. Ordered an emergency surfacing maneuver in the direction of a contact. Contributing to the operating errors of the combat systems team was their failure to adequately manage the civilian visitors so that they did not distract the watchstanders from the efficient execution of their duties. A detailed discussion of the operating errors follows. The analysis also considers the design of the Ehime Maru and the survivability of the fishing vessel in the accident. Finally, the National Transportation Safety Board determines that the probable cause of the collision of the USS Greeneville with the Japanese fisheries training vessel Ehime Maru was the inadequate interaction and communication among senior members of the combat systems team (the commanding officer, the officer of the deck, the fire control technician, and the sonar supervisor), which resulted in the failure to perform adequate contact analysis and adhere to proper procedures for moving to periscope depth; and the commanding officers decision to order an emergency surfacing maneuver. Contributing to the cause of the accident was the failure of the crew, in particular the commanding officer, to adequately manage the civilian visitors so that they did not impede operations. 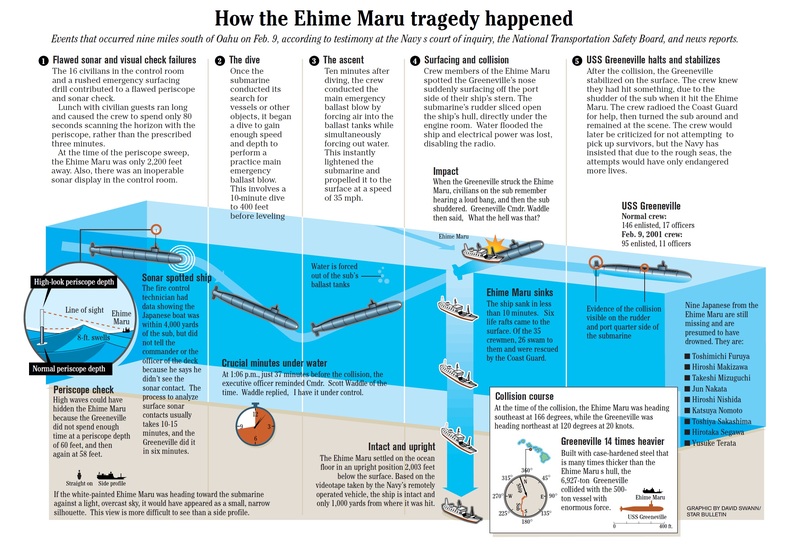 Contributing to the loss of life was the rapid flooding and sinking of the Ehime Maru, which occurred when the submarines rudder tore through the fishing vessels lower deck spaces.